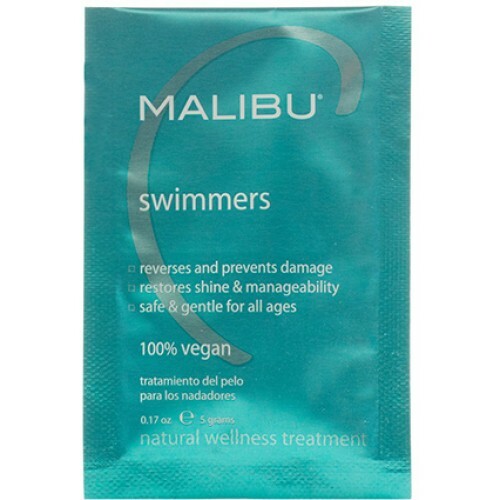 Swimmers Wellness Hair Treatment dramatically improves the look and feel of hair, no matter the time spent in the pool or in the ocean. Removes copper build up which causes green discolouration after swimming. Prevents brittle, damaged hair and sooths dry, itchy scalps caused by harsh chemicals in water. Shampoo, rinse and pour Swimmers crystals across wet palm. Rub hands together, adding water to dissolve crystals. Apply and scrunch throughout hair, then allow to remain on hair for up to 5 minutes. Rinse, shampoo, rinse again thoroughly. Apply conditioner. For damaged hair, the Malibu C Miracle Repair Hair Treatment is recommended instead of conditioner.